Paster Reverend Carley Friesen, of the Mount Tabor Presbyterian Church, in Portland, Oregon, captured this photo of the Church’s seven circuit styled labyrinth located outside on the church grounds. Nancy Haught for The Oregonian newspaper featured this image in her article entitled, Walking labyrinth’s one way to welcome autumn. I tend to be a somewhat inhibited person… It was fascinating to me: Walking into the center, letting go of the junk of your life — middle or center is a place with room to be receptive — and, coming back out, taking on new intentions. It was particularly powerful to me, to connect my spirit and my body. I love the simple, organic-ness of this labyrinth, how they used paving stones to outline it thus turning the existing grass into the pathway. 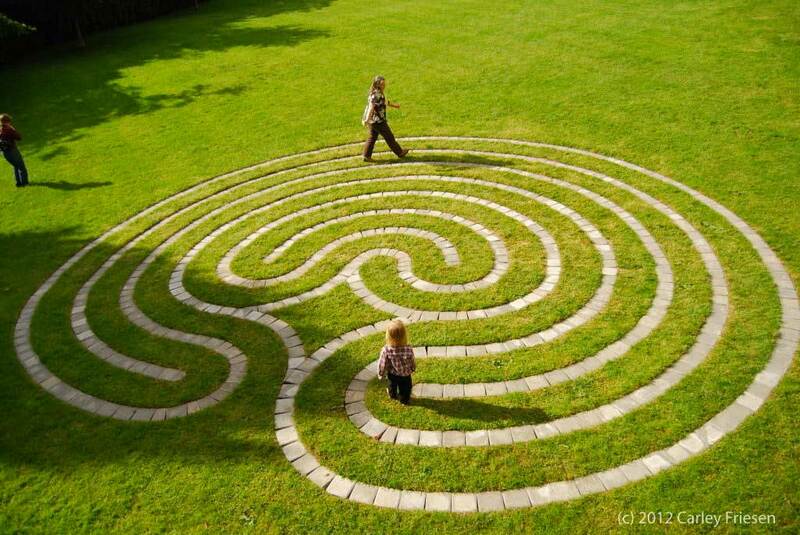 Labyrinths just provide a wonderful, peaceful path that can help us on the journey of our lives. Sometimes the path of a labyrinth becomes a metaphor for our lives, and we become aware of lessons we can learn along the way. Sometimes our path in life can seem like we traverse it in circles; when if we really look at it, we find rather that our path goes more the way of a labyrinth. The Mount Tabor Labyrinth reminds us to keep moving forward, trust in the process, believe in our ability to find our way home.